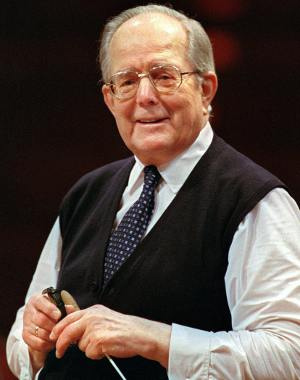 I have been quite moved the last couple of days reading the tributes to conductor Wolfgang Sawallisch, who passed away on February 22 at the age of 89. Classical music enthusiasts couldn’t help but be aware of his long career and many recordings. Over the years, he served as Principal Conductor of the Vienna Symphony, Music Director of the Orchestre de la Suisse Romande, Bavarian State Opera and Philadelphia Orchestra, and Honorary Conductor Laureate of Tokyo’s NHK Symphony. He was also a fine pianist, frequently serving as lieder accompanist for many of the world’s great singers. Dating back to the LP days, I have long owned and been an enthusiastic fan of his recording of the complete symphonies of Franz Schubert, and his much-lauded collaboration with Dennis Brain on the Richard Strauss Horn Concertos. Reading of the changes he brought to the Philadelphia Orchestra when he took over as their Music Director at age 70 confirmed the belief that I had had that he was a much-loved figure, and made a huge impact, there. Philly.com has a long and excellent obituary, as well as tributes from musicians and friends. The New York Times obituary has quite a lot of information, as does NPR’s Deceptive Cadence blog (accompanied by some nicely chosen Sawallisch videos). There’s also a brief survey of his recordings at the Gramophone website. YouTube videos featuring his work include complete performances of Strauss’s Symphonia domestica and Benjamin Britten’s War Requiem. I’ll try to strike a more joyous note, with Mr. Sawallisch conducting the NHK Symphony in one of my all-time favorite symphonic movements, the Finale of Beethoven’s Symphony No. 7. Hello once again, Sunday Salon readers! After a three month break, I’ve decided it’s time to get back to blogging. Why did I take a break? Laziness is the only answer I can offer. For a time it was enjoyable to read – among the books I’ve completed in the last several weeks are Arnaldur Indridason’s Jar City, William Dalrymple’s In Xanadu, and Michio Kaku’s Physics of the Future – and listen to music and browse the Internet without constantly thinking of writing about the experiences. On the other hand, something was also lost in terms of my attention level. And I do sometimes come across things that I really believe would be of interest to others, and helping to spread the word about worthwhile stuff has great satisfactions. I won’t bother to talk about what’s in the works for the blog in the immediate future, since it’s the same stuff that was in the works three months ago. You can scroll back to past Salons if you’re curious. One new thing that I can point to is that I have set up a page at Letterboxd to document my movie watching. While it’s probably of interest mostly to me, as an aide-mémoire, you’re welcome to take a look too. Evident is my recent interest in film noir, and ongoing interest in Japanese and other Asian films. Any film reviews I might do at the blog will also be linked at my Letterboxd page.